1. Pong (1972) – When I was really young someone had a console version of this game and it blew my mind. 2. Adventure (1979) (Atari 2600)- This was my first video game for my Atari 2600…I played it for hours on end. I even found the easter egg. 3. Pitfall (1982) (Atari 2600)- I literally played this game looking for this elusive gold city that’s supposedly in it. Well it turns out there is none. 4. Pole Position (1982) (Arcade/C64) When I drive on the expressway I still hear “Prepare to Qualify” When I got a Commodore 64, it was the first game I programmed, and saved on my old cassette recorder. 5. Bards Tale (1985) (C64) – My first real RPG, I loved this game and series so much. I bought graph paper, and mapped every square inch of the dungeons in the game. 6. 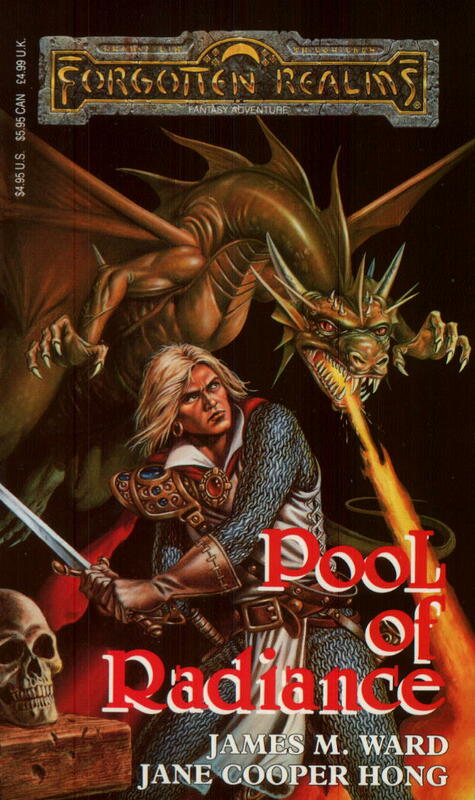 Pool of Radiance (1988)(C64) – This brought to life several things for me. The Forgotten Realms a setting I adored within Dungeons and Dragons world, and better graphics and combat system that I was really yearning for. 7. Street Fighter 2 (1991)(Arcade) – The battles I had in my local bowling alley arcade were epic, the only player who had the same level of expertise as me became a good friend, he moved away and I still miss him. 8. Mortal Kombat (1992) (Arcade) – The fighter war continued here, everyone picked the ninja’s Scorpion and Sub Zero…but I was a Raiden master. Finish Him! 9. NHL 94(1993) (Sega) – This game me and my brother really bonded over, and this is the reason I’m not a Blackhawks fan, my brother was always the Blackhawks, and I picked the next best. The Penquins…you know how hard it is growing up in Chicago, as a Pens fan. 10 – Samurai Shodown (1993) (Arcade) – The last of the fighting games I excelled at in the arcade. I loved this game cause it fueled my love for Japanese culture, and had weapons in it. 11. Baldurs Gate (1998)(PC) – This series picked up where the Gold Box series left off. Great Story Telling, and gameplay kept me coming back time and again. The sequel Baldurs Gate 2 just built up that. 12. Aliens Versus Predator 2 (2001)(PC) – This was really the last FPS I mastered. I was even in a Clan, that competed a lot called Hell’s Legion. I was a master at the Predator. Nothing like ripping a marines head off. 13. Dark Ages of Camelot (2001)(PC) – This was my first MMO, and when I was laid off in 2002 it really cushioned the blow. The friendships I made back then are still with me today, and I still game with a lot of my guildmates from back then. 14. World of Warcraft (2004) (PC)- What can I say, 10 years later I’m still playing this game, a fourth of my life. It has been through the thick and thins of the past 10 years. I’ve made some wonderful friends, and played with some old ones in this game. A lot of memories in-game. You can’t get more influential then that. 15. Warhammer Online (2008)(PC) – This game got me more friends, but it also is where I started my video game blogging adventure. A hobby that would have the most effect of my life to date. So that’s it…What are your most influential games? This entry was posted on March 25, 2014 at 4:31 pm and is filed under Gaming, MMORPG with tags 15 Most Influential Games. You can follow any responses to this entry through the RSS 2.0 feed. You can leave a response, or trackback from your own site. This is shaping up to be an interesting series of posts across our little segment of the blogesphere. I seem to match up with exactly one game on any given list. But at least I match up on one! It is pretty interesting, to see how games shaped other people’s lives as well. Nice list, mine’s not too far off. I’d swap out 1-3, 8, 10, 12, 13, 15 and replace with Starflight (PC), Pete Rose Baseball (PC), Centipede (Atari), M.U.L.E (Vic20? ), Ghosts ‘n’ Goblins (Arcade), Planescape:Torment, Ultima Underworld and TES:Oblivion. I wouldn’t have put Pole Position in my list but seeing it in yours… yep, that was a seminal arcade game for me back in the day. All some great games, as a side note the Tron movie was a HUGE influence in my life. Loved the game too. That game was the best. Freakin loved it! TOTALLY forgot about it. Again, this is why I love these lists! How the heck are we supposed to limit this to 15?! I give up.